Earlier, Briceño spoke about Guatemala using its unfounded claim to distract from the crises affecting its people. 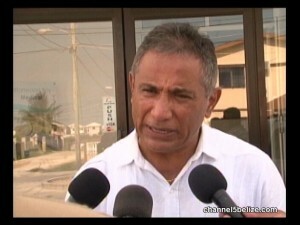 But here’s the thing – he says that to some extent that’s the same thing happening in Belize. According to the Opposition Leader, while everyone’s focus has been on Guatemala and related issues, Belize continues to experience serious social and economic woes. Congrats Briceño … you should have come up with this weeks ago. I am happy that the opposition is making its point known. Now going to starstoon to stir the river which is about to boil over…now that is bull crap. You can demonstrate in Belmopan…in Belize City…anywhere except there. Cooler heads need to prevail. So now you think I am not patriotic because I do not want to go there… bull crap again. I am looking out for my future, for the future of my family. I do not want to see gunfire exchange between Belize and Guatemala, that would lead to the collapse of the Tourism Industry to name a few. Melchor is feeling the decline in Belizeans shopping there, do we want mass tourist cancellations? Tourist do not travel in countries where we have War. I work hard and live off the Tourism Industry and I do not want to see that in danger. So I make my stand hoping cooler heads prevail.